BE CASHED IN THE UK. AS SEEN IN THE PHOTOS. 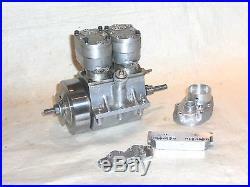 TWIN CYLINDER 10cc 4-STROKE, SPARK IGNITION, WATER COOLED MODEL PETROL/GAS ENGINE, PART BUILT &. 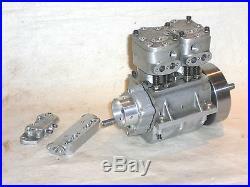 A RARE CHANCE TO OBTAIN AN ALMOST COMPLETED CLASSIC E. WESTBURY DESIGNED "SEAGULL" ENGINE, I`VE HAD THIS FOR A WHILE AND HAVE DONE NO WORK ON IT, IT`S STILL EXACTLY AS I ACQUIRED IT! I JUST HAVE TOO MANY OTHER PROJECTS I`M WORKING ON. 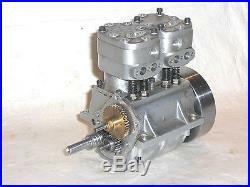 DESIGNED CIRCA 1950 BY EDGAR T WESTBURY BORE :- 3/4" STROKE :- 11/16" THE WORKMANSHIP/MACHINING LOOKS EXCELLENT, MOST OF THE ENGINE HAS BEEN COMPLETED, AND THE MAIN CASTINGS HAVE BEEN ASSEMBLED INTO THE ENGINE SEEN IN THE PHOTOS. 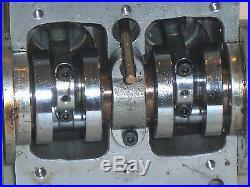 THIS HAS CYLINDER LINERS, PISTONS, CON-RODS, CRANKSHAFT, CAMSHAFT, VALVE GEAR, BEARINGS & TIMING GEARS FITTED. THE ENGINE AS ASSEMBLED TURNS OVER SMOOTHLY. 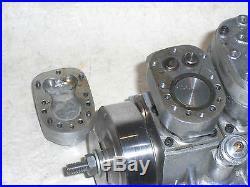 THE TIMER/DISTRIBUTOR CASING IS PARTLY MACHINED, THERE ARE NO OTHER PARTS PRESENT FOR THE TIMER/DISTRIBUTOR ASSEMBLY. 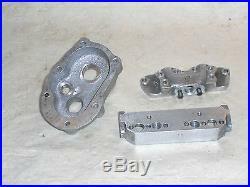 THE CARBURETTOR CASTING IS MISSING (HEMINGWAY KITS STILL SUPPLY CASTINGS FOR THE SEAGULL). 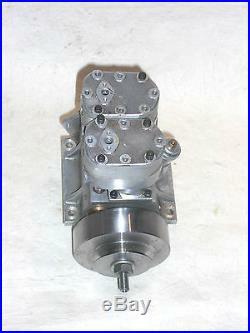 THE TIMING GEAR CASE CASTING IS PARTLY MACHINED. AS ARE THE INTAKE AND EXHAUST MANIFOLDS. NO OTHER PARTS OR CASTINGS ARE INCLUDED. 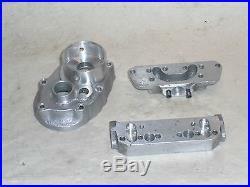 ALL OTHER PARTS/CASTINGS REQUIRED & ANY SMALL PARTS/SCREWS/FIXINGS ETC WILL NEED TO BE MADE OR SOURCED BY THE PURCHASER. CONSTRUCTION OF THE SEAGULL ENGINE WAS SERIALISED IN THE MODEL ENGINEER MAGAZINE IN THE 1950s, SO DETAILS OF THE ENGINE CAN ALSO BE FOUND THERE. PLEASE VIEW THE PHOTO, ANY QUESTIONS, PLEASE ASK! SLEAFORD LINCOLNSHIRE POSTCODE AREA NG34. The item "RARE, PART BUILT, EDGAR T WESTBURY SEAGULL 10cc TWIN CYL MODEL PETROL ENGINE" is in sale since Thursday, January 07, 2016. 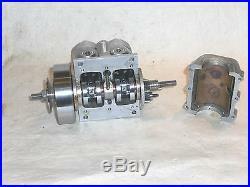 This item is in the category "Toys & Games\Radio-Controlled\Aeroplanes\Aeroplane Engines". The seller is "bluebottle52" and is located in SLEAFORD LINCOLNSHIRE.